Today we got a call from Kern County Animal Shelter and said they picked up a Pug that had a severely broken leg and if no one picked him up yesterday he would be put down. Of course our first thought was “oh no!! We have no funds to care for this”, as you know we have gotten hit hard with medical cases. We struggled as we wanted to help this baby that is only 2 yrs. old. Once they sent us a picture of his sad face, we couldn’t say no and said we will somehow figure out how to pay for this. One of our volunteers drove 6 hrs. to Bakersfield and back to OC to get him into the Emergency Clinic right away. We were able to get to the shelter just as it closed otherwise he would have been put down. Got him to the ER at 10:30 at night. Once I saw the leg I realized we couldn’t save it. From the elbow down it is dead. Hard as a rock, not blood flow through it at all and atrophied. It looks like it happened at least a month ago and this little guy has been suffering greatly. It appears he got it caught in a trap or something as it is a clean cut across the elbow area. There is a only a bit of skin attached to the back of the elbow the rest is cut straight through to the bone and the bone is exposed. The bottom part of the leg was deprived of blood and died. Though Valentino is getting his leg amputated tomorrow, we feel that on Valentine’s Day Valentino found true love in the arms of everyone at Pugs ‘N Pals. From this moment on he will be cared for, loved and every need taken care of. Every one at the ER fell in love with him and said he is so sweet and loving. It will be a long journey for Valentino, but he will have all of us supporting him every step of the way. We would appreciate any donations you can send for Valentino’s care. We have been really hurting financially and the last thing we needed was another major medical case, but Valentino deserves the care he will get as it is obvious he has not received love and care up to know. All I could do was cry, just so unfair, he shouldn’t have had to go through this. He had to have a blood transfusion before surgery due to being so anemic. Our Vets literally gagged, they said in all their years they didn’t see anything like it. That leg and the infections was horrible, pics can’t give you the reality of it. They said how he lived like this is incomprehensible. That once the leg died he probably didn’t feel anything, other than the severe infection he has, which truly the smell was nauseating. 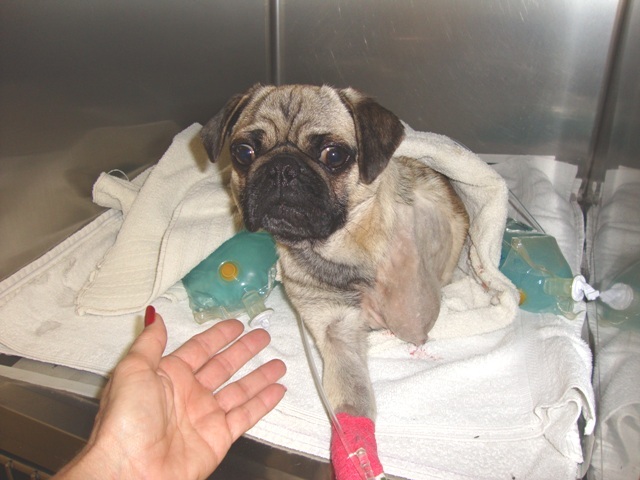 But while the leg was slowly dying the pain had to so horrific that they don’t know how he endured it. This had to be over a month old as there is a lot of muscle loss on the shoulder. For that I was crying for him. I know now he is going to be just fine, but my heart hurts for what he had to endure. Now the journey begins towards his new life filled with love. Recuperation will take a while and assuming not set backs like infection set in, the prognosis is good. Just going to be in a lot of pain for a while, but we will control it through meds. Valentino came home last night and is doing very well. He is truly emaciated, didn’t realized how much as I was always holding him and didn’t see him standing till last night. Of course he is in pain and trying to adjust. He is on pain meds and antibiotics. He was also loaded with whipworm, roundworm and tapeworm, probably one of the reasons why he is so skinny. So we are working on clearing that as well. I have more work to do in his head than I do his body. He doesn’t know love or how to deal with it. When I come into his room, he goes to a corner of his pen, cowers, puts his ears back and shakes non stop and gives me a look that pierces my heart. He is clearly waiting for me to hit him or harm him in some way. His eyes pleads for me no to hurt him, and looks at me as if to say “what are you going to do to me” I can’t stand to see him so scared. He has had a much harder life than I thought. I cry thinking what he must have endured, so much more than just his leg. He guards his food even from me and growls because he thinks he has to fight for it. Yet he doesn’t have a mean bone in his body, he just thinks he has to guard it. He will need a lot of care medically, but more so psychologically. Love heals all and he has a lot of that. I know in a matter of time, he will be happy to see me and connect me with love and not fear. Can’t wait till the first tail wag and first kiss that I get from him. Not only is he truly beautiful, he is incredible sweet. I can’t imagine why humans would do this to such precious babies. We ask for your prayers that all goes well with out beautiful Valentino. If you can send a donation to help with his medical care we would REALLY appreciate it. We have been hit hard last year and already this year. But we feel these precious babies need us and we must do all we can for them. Valentino is doing remarkably well. He is amazing. He is less and less fearful, loves people, he is super affectionate with me, because he trusts me more than others. Tthe improvement is short of amazing. He gets around so well, runs around the yard at 100 MPH, you would never know he is missing a leg. Dogs are just wonderful, they don't let anything stop them. We can learn a lot from them. We are still working on his weight- he has already gained 3 lbs and getting rid of all the worms. But dear lord what a fabulous boy he is. I am so happy we saved him, he got lucky! We are still working hard at raising money for his surgery. If you can help in any way, we would really appreciate it! Thank you! Poor little guy. Thanks for taking care of him. Teri, you are a wonderful person. How is Carnia doing? Thank you! Carina is doing very well, still struggling with some health issues. We clean one up and another one pops up! I cannot believe that no one would have taken the litte guy for help. How could anyone even look at him in such pain. Thank heavens for people like you. Is little Chance able to walk? OMG - This is heartbreaking! Thanks so much Teri for taking this sweetheart in and for seeing that he gets the medical care and love he needs to heal. Please keep us posed. This is probably a dumb question, but is anyone networking Pugs 'N Pals on Facebook to raise funds for the very sick and injured pugs? Yes we do have a facebook account and have put Valentino on it, but not many hits on helping financially. We would appreciate it if you guys can pass the info. around. On 2/25/11 we found a stray adult male pug in our Bakersfield NW neighborhood. Dog had no id tags, tats or microchip (had him scanned at Vet). This after calling city animal control and leaving message regarding stray. I had concerns about turning him into animal shelter but feel relieved that Kern AC had contacted you regarding Valentino. Heartbreaking that a defenseless animal could be so mistreated. 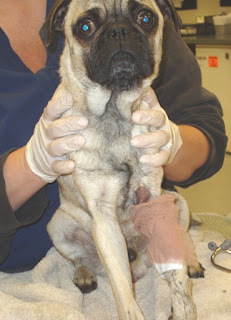 I learned at my Vet's that they also had recently received a pug which was found by one of their staff workers. They are hoping to find dog a home. I checked local lost/found and saw a female pug found and I called out of curiosity. I learned the female pug had been found nearly two weeks ago and no one had inquired; I am the only caller. So what's up in Bakersfield? Seems very unusual to me that Pugs are turning up lost in our city. I have posted Found ad in local paper and Pet Harbor websites as well as flyers in neighborhood. No inquires yet on this third day. I suspect he was abandoned. He weighs 18 lbs, very friendly, gets along with my other dogs. Thinks he is a lap dog. Needs dental cleaning. 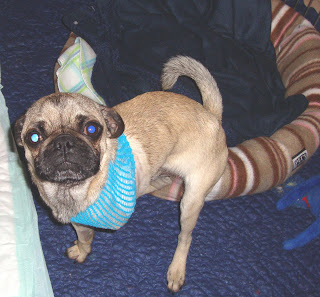 Never have had a Pug; so I not familiar with all the grunts and noises he makes. Sometimes he cries in fear or pain when trying to clear his nose or throat. Don't know what that means. I can't keep him so I am seeking advice if no one claims him. If Animal control returns my call, I will not turn him in yet. Good news! Tonight the owner claimed the stray Pug from 2/25. Dog is named Jack and is 7 yrs old. Owners were away for long wkend. Gardener left back gate open. Happy reunion and all is well for Jack. Thank you for picking up the Pug and find his owner. Though if it was in pain and grunting, they are not taking good care of him. 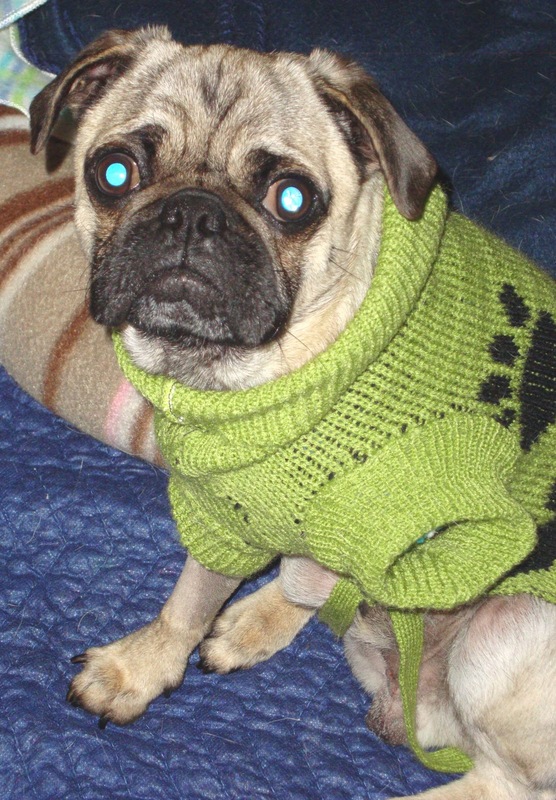 There are a lot of Pugs, dogs in general in Bakersfield because there are a lot of puppymills and breeders there. A lot of the dogs are also just running lose. Valentino got lucky that we were notified, normally they do not do that. For every 1 we save there about 8 get put down. Some of the workers are very compasionate but as shelters go, it is a hell hole, pretty bad place. Hello Tina ! I feel soooooo bad for this poor little guy. How could somebody let this happen to an innocent animal? P.S. I went to the section of available dogs. Happy to see so many adopted! (especially cute little Abby) But when I scrolled down to the "pals" section, Keats wasn't there. What happened? I didn't see Panda either. Valentino is now up for adoption YAYYYYY!!!!!!!!!!! Sorry for the late response. I have been sick for several months. Unfortunately we lost our beautiful Keats to lung Cancer and our beautiful Panda to stomach cancer. These are our babies as long as they are with us, so we take it really hard. The only thing that helps is that we know we gave them a wonderful loving life at the end. OMG!! My heart has broken.. How in the world do you hurt such a sweet face like his? A dog's life is just as precious as our own and shouldn't be out into danger like this. These things make me love and appreciate my pugs even more. I praise you for taking him in and loving him. It's so sad..
Pugs 'N Pals is the update blog for our Pug Dog (and other breeds) rescue operation in Southern CA. You can find more information about our organization and events at our website, www.pugdogrescue.com.